Picture yourself here....I know I'd like to go! I find coloring very relaxing, and hadn't quite cleaned up from yesterdays post using the new DoodleFactory Tropical Backdrop, so decided to create another version of this card, using the Marker Watercoloring Technique, but also added some popped up layers, and a bit of shimmer using my Spica Glitter Pens. 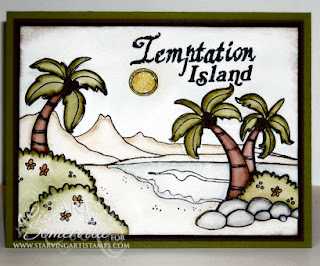 I think the sentiment Temptation Island from the Tropic Sentiments is very fitting for this backdrop, don't you? 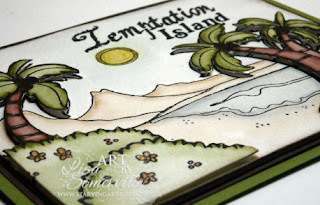 Finished Size - 5-1/2" x 4-1/4"
Lisa, this card is gorgeous! I love watercoloring!! Thanks for the inspiration!!!! Terrific card!! The coloring is lovely! hmmm...the temptation of booking a flight and going to an island is hard to resist!